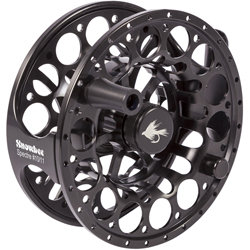 Snowbee Spectre Fly Reels, includes the new Gunmetal Silver colour, plus Cassette models, for the multi-line angler. An ultra-lightweight, precision CNC machined aluminium reel at an amazing price! Machined from high grade, aircraft aluminium bar stock, the unique design removes the maximum amount of metal, whilst retaining optimum strength and rigidity, for an ultra-light weight and better rod/reel balance. The multi-disc cork and stainless steel centre drag, offers superb performance, with minimal start up inertia, while the large arbor design allows faster retrieve, more consistent drag performance and minimal line memory. 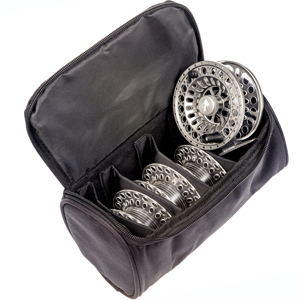 The extended range covers all requirements from the smallest brook fishing up to salmon, seatrout and saltwater. Complete with a Neoprene reel case, this range offers unmatched performance. Snowbee Spectre Fly Reel #2/3, the smallest reel in the range, the Spectre #2/3 makes an ideal companion for the smallest brook rod, where light weight is all important. Snowbee Spectre Fly Reel #9/10 offers the salmon or saltwater angler a quality reel with ample backing capacity and enough ‘stopping power’ to handle anything you may come across. Snowbee Spectre Fly Reel #10/11 is the perfect choice for the Salmon angler fishing big rivers with big lines. Capable of holding a full #10/11 Spey line plus 300yds of backing. Equally suited to heavy Saltwater fishing. 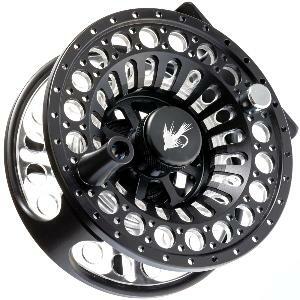 Snowbee Spectre Fly Reel #3/4 model is ideal for small river rods around 8ft, offering the perfect balance. Choice of either Black or Gunmetal Silver. Snowbee Spectre Fly Reel #5/6 is the perfect choice for the angler who fishes slightly larger rivers, with rods of around 9ft, but also has sufficient backing capacity for small stillwaters. Snowbee Spectre Fly Reel #7/8 will be the choice of larger river anglers, fishing sea-trout or salmon with single handed rods, or larger stillwater & reservoir anglers, who want a great looking, quality reel, with a powerful drag and sufficient backing capacity to handle large fish. 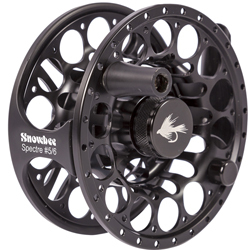 Snowbee Spectre Cassette Fly Reel #5/6 is the perfect choice for the angler who fishes slightly larger rivers, with rods of around 9ft, but also has sufficient backing capacity for small stillwaters. 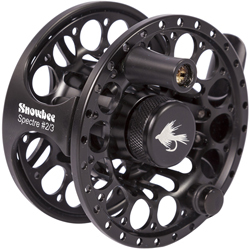 Snowbee Spectre Cassette Fly Reel #7/8 will be the choice of larger river anglers, fishing sea-trout or salmon with single handed rods, or larger stillwater & reservoir anglers, who want a great looking, quality reel, with a powerful drag and sufficient backing capacity to handle large fish. "Nice compact reel that still retains what I call a proper large arbor design. Being a cassette system it will find favour with those anglers who carry an array of lines." Snowbee Spectre Cassette Fly Reel #5/6 + 3 Spare Cassette Spools & Reel Case, is the perfect choice for the angler who fishes slightly larger rivers, with rods of around 9ft, but also has sufficient backing capacity for small stillwaters. 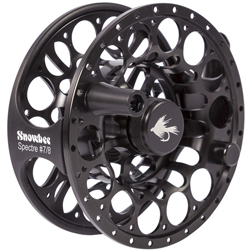 Snowbee Spectre Cassette Fly Reel #5/6 - Specification: Diameter: 3.4"/86mm Weight: 150g. Backing Capacity WF6F + 75yds 22lb Braid. Kit consists of a Cassette Reel & Spool, plus 3 Spare Cassette Spools and Spool Case. Snowbee Spectre Cassette Fly Reel #7/8 + 3 Spare Cassette Spools & Reel Case, will be the choice of larger river anglers, fishing sea-trout or salmon with single handed rods, or larger stillwater & reservoir anglers, who want a great looking, quality reel, with a powerful drag and sufficient backing capacity to handle large fish. 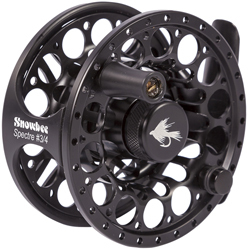 Snowbee Spectre Fly Reel #7/8 - 10549 Specification: Diameter: 3.7"/94mm Weight: 145g. Backing Capacity WF8F + 100yds 22lb Braid.